These days, we can make virtually anything out of a few grams of PLA. However, it’s still fairly difficult to print full musical instruments (or even instrument parts) that produce high-quality sound comparable to the kind created by instruments manufactured in a more traditional manner. But that’s exactly what makers Kaitlyn and Matt Hova have done. The hovalin is a completely 3D printed violin that’s proof that there’s no reason for an instrument’s acoustic quality to suffer just because it was made with a MakerBot. Once the model was designed, it had to be divided in a way that accounted for the constraints of a commercial FDM printer’s build volume. “It’s a weird game that’s most parallel to the idea of cutting up a violin made out of jello so that each piece can fit in a small box and be oriented so that it would not collapse on itself,” say the Hovas. It took months of trial and error before they successfully printed the Hovalin 1.0. With Kaitlyn’s experience as a professional violinist, neuroscientist, and software engineer at 3D Robotics –as well as Matt’s diverse careers in record production and electrical engineering– the husband and wife team have all the bases covered for this project. The Hovalin is a fully functional 3D printed violin that sounds nearly indistinguishable from a world-class wooden version. 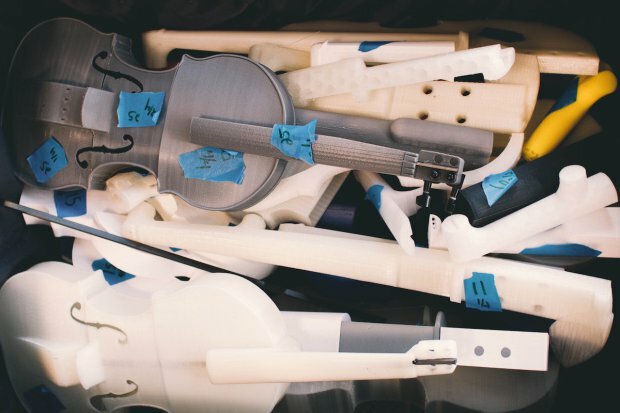 What’s more, the Hovalin team designed the violin in such a way that it requires less than one kilogram of PLA to make. This helps keep production costs low, as the cost of raw materials comes in at around $70 for STEAM (Science, Technology, Arts, Engineering and Math) programs.